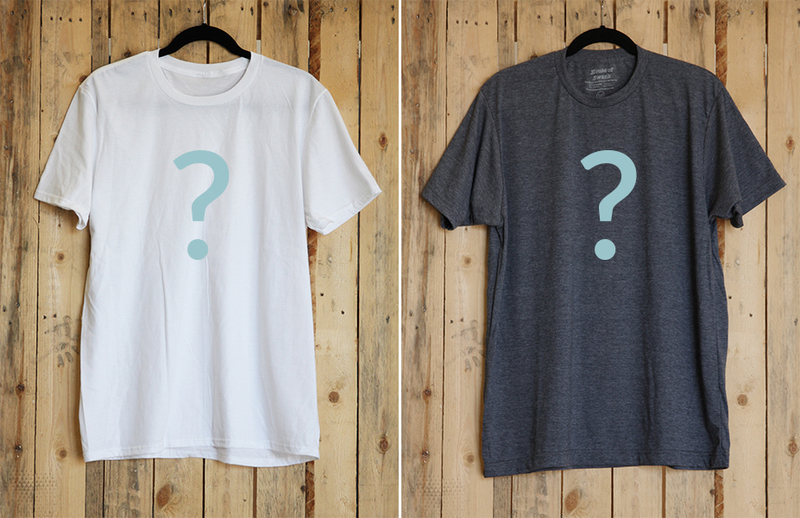 We Want YOU to design the New Spoonflower T-shirt! We could not be more excited to announce that our newest design challenge is open for entries today: the 2017 Spoonflower T-Shirt Challenge! We will be ringing in 2017 with a brand new Spoonflower tee printed by Raleigh’s own House of Swank and we want YOU to design it! The theme is simply: Spoonflower. What does Spoonflower mean to you? What kinds of things come to mind when you think about the brand? Is it sewing? Design? Community? Flowers? Spoons? Put it all down into a unique, never before seen repeating surface pattern. Here’s the tricky part: you are allowed to use just 3 colors. Elements of the winning, all-over repeat design will be screen printed onto both white t-shirts and charcoal gray (the t-shirts shown above are the actual shirts we will use) so make sure to pick a color palette that would look great on both. The grand prize winner will receive $500 in cold hard cash (cha-ching). In addition to the cash prize, the grand winner will receive a $250 Spoondollar credit and a free t-shirt printed with their winning design. The design itself may continue to be available for sale in the Marketplace where you can earn up to a 15% commission. 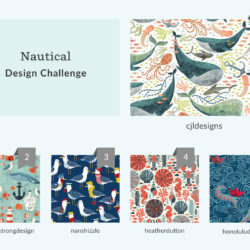 To decide the grand prize winner, Spoonflower will be choosing the design we feel best fits our brand personality from the top 10 popularly-voted designs entered into the contest. Once a winner has been chosen, we will then work with the winning design to add our logo, and pick out elements that we would like to go on the t-shirts. 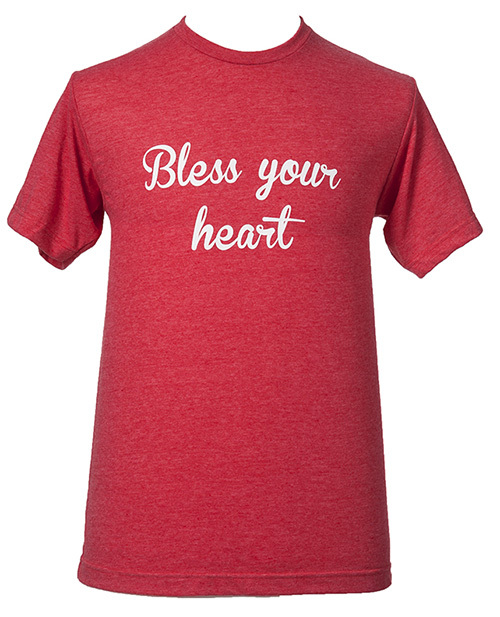 Please keep in mind that while we are asking you to create an all-over print that would look great on fabric yardage, wallpaper and gift wrap, we are just going to be pulling out certain elements of that design to place onto our t-shirts. 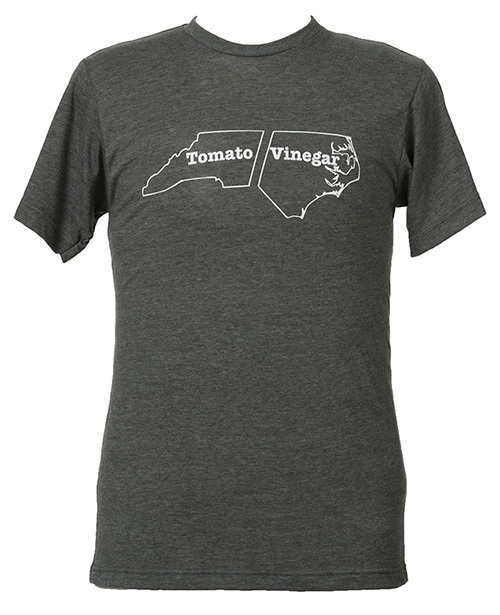 When we sat down to think about who we wanted to produce these shirts for us, we knew we had to go local. 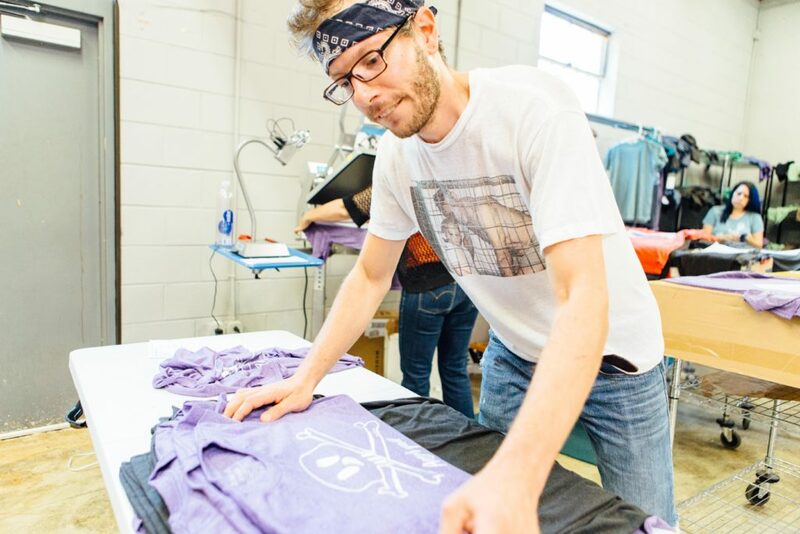 Our neighbors, House of Swank, print all their super rad t-shirts in-house on crazy super soft t-shirts. Right in our backyard of Raleigh, NC! Get to know full-of-personality House of Swank owner John Pugh (or as he’s more affectionately known, Johnny Swank!) in our Q&A below. 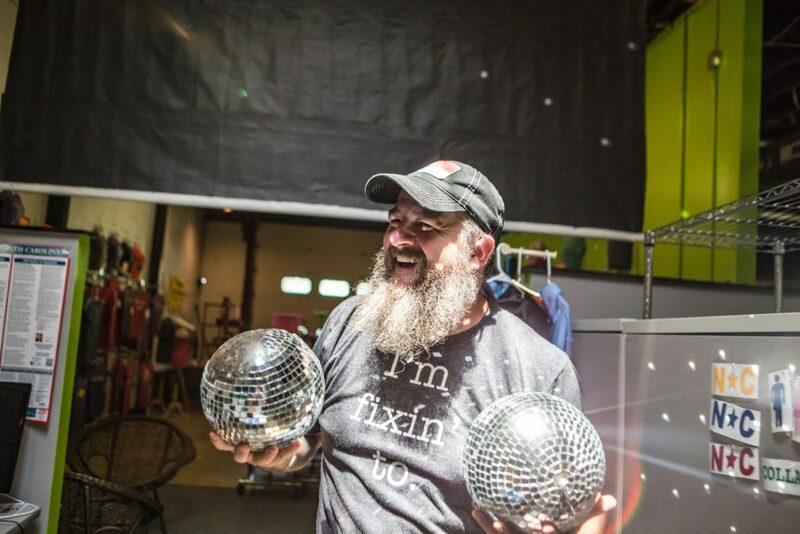 Johnny Swank himself — he’s fixin’ to disco! 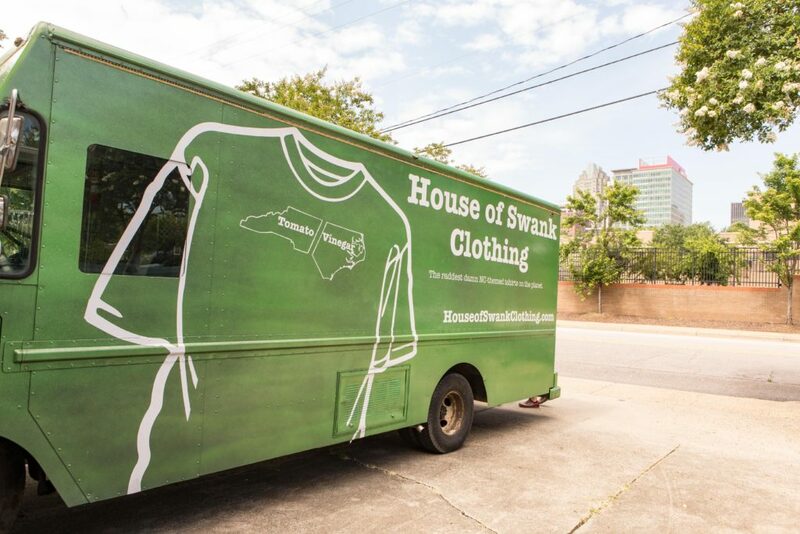 Spoonflower: When and how did House of Swank get started? John Pugh: The House of Swank started about 6 years ago. I had been playing blues gigs around town under the name of “Johnny Swank.” (I picked up that nickname when I thru-hiked the Appalachian Trail in 2000. Anyways…) I had a little demo CD and wanted something to go with them. Went to the craft store, bought 6 shirts, screen printed them in the kitchen of the little apartment we were living in, sold them, bought 12 more, sold them, and 6 years later here we are. SF: If you could describe your business’s personality in three words, what would they be? SF: What makes you proud to be an NC company? JP: I grew up in the big city of Climax, NC, and have had the chance to live in several place from the coast to the mountains. 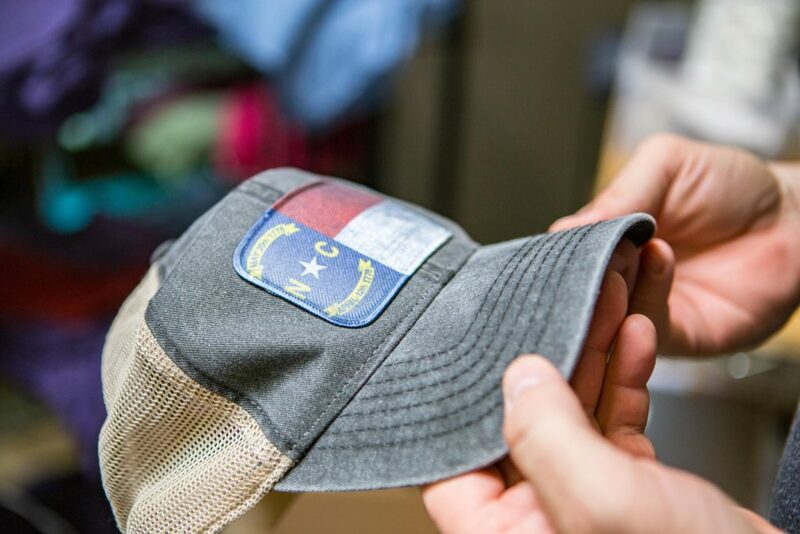 NC is who I am, and I’m proud to put out products for others to rep our state. SF: Lexington style or Eastern style barbecue? JP: I’m BBQ agnostic, so I’m eating either style if it’s on a plate in front of me. That said, Eastern style is the only correct answer. SF: What makes your products unique? 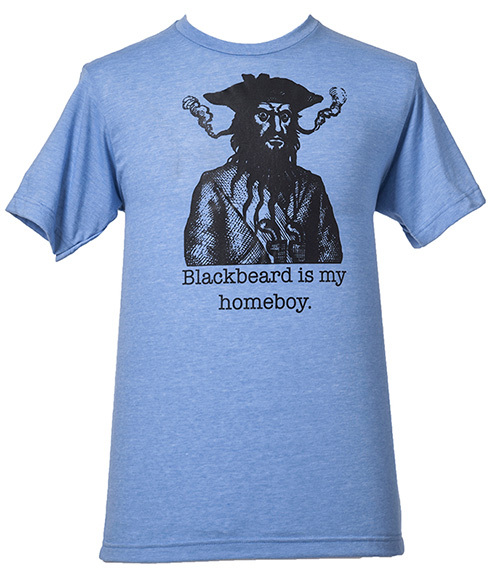 JP: I think one of the things that sets us apart are the hyper-local themed t-shirts. I freaking love all the sayings and weirdness that comes from being from a small town, and I like to lend that sort of flavor to everything we do. I’m all about simple designs with a pinch of snark. Basically, shirts you can get away with wearing to your mama’s house. SF: How do House of Swank and Spoonflower relate to each other, and why are you excited to work together for this t-shirt challenge? JP: I’m a total Spoonflower fanboy. Seriously. 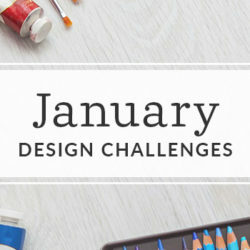 I love the crowd-sourced design challenges, custom designs, and the whole business ethos. 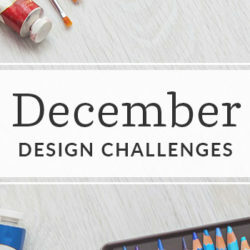 Could not be looking more forward to working with Spoonflower on this t-shirt challenge! It’s going to be completely rad. SF: How do you come up with the designs you offer on House of Swank? SF: I noticed you offer a lot of political t-shirts for both sides of the political spectrum. Tell me a little more about that, and where do the proceeds go? Political stuff is something we’ve dipped our toes into over the years. We have customers and fans from all over the spectrum, and I’ve tried to make a point to not go negative on anything. Life’s too short for that crap, and it’s a fine line to dance to be sure. Part of the proceeds from our political shirts (and all the shirts, really) get fed into the donations to several local charities that we support each year (Equality NC, Planned Parenthood, Raleigh Rescue Mission, Earthshare NC, Coats for Kids, etc). Be sure to enter into the first-of-its-kind Spoonflower T-Shirt Challenge before the deadline on November 15th! We can’t wait to see what you come up with! I have a nice design, for a all over print shirt, but I can’t find where to submit it. What the requirements are. I see a timeline, Perhaps I have a blind spot. And I am not sure if you want any type of logo to identify people with spoonflower, or just want a beautiful shirt? Hi Ry! Instructions for how to submit your design can be found here: http://www.spoonflower.com/contests/2017-spoonflower-t-shirt Don’t worry about the logo, we’ll add that in once a winner is chosen. Just submit an all-over print that represents Spoonflower to you. The t-shirt contest says entries will be previewed at TWENTY-ONE inches wide, but when I made a test entry the ‘this is how your design will look in the contest’ shows up at TWENTY-SEVEN inches wide. I believe this is a leftover from the tea towel contest. I know it’s SUPPOSED to be based on a basic cotton ultra fat quarter at twenty-one inches wide, but that’s not what’s happening. Sorry about this, this has been updated! Would like to enter this challenge, just one question. When it says 3 colours only, is white included in the 3 colours? Yes, white and black are both included in the three colors. So if we choose white as our base, we can then use 2 colours only (which may or may not include black) – is that correct? I’m quite confused and it looks like other’s are too. Please can you confirm if we should use 3 colours (including the base colour) or 3 colours on top of the base colour? The design will be printed on both charcoal gray and white t-shirts, so you will need to include white in your design if you want it to show up on gray (and so that’s one of your three colors) and likewise if you want gray in your design, you will need to have that as one of your 3 colors in order for it to show up on white, as such it is part of your 3 colors.) I hope that helps to clarify! I think the difficulty here is that presumably the file would be supplied with a transparent background for the tshirt printing, but for the repeat pattern we need a solid base (either white or charcoal grey). So we are ‘wasting’ one of our colours on providing the background for the repeat tile. 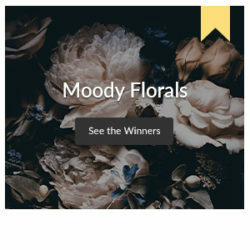 When designing and submitting your work for the contest, we will NOT consider the background color you choose as part of your design. That will not count as part of your 3 colors, only the colors that are integral to the actual design elements and not the background. There can only be 3 colors used total, including white! They are including white because someone could design with white ink to be printed on the Grey but of course would not be a good choice to print on white. The background colors of white & grey are the background only. I agree, you’d think that the colours we use are the palette of inks to be screen printed, so three colours for placement on either white or grey. But the info here seems to contradict this logical assumption, so I’ve gone with 2 colours on white.